Today has been bittersweet – it started off with tears and is ending with joy – with much happiness in between. We met our students at drop-off this morning around 8:30 a.m. – with their suitcases – and that meant leaving day. Julie Lane, on her first trip to Israel chaperoning our trip, said the goodbye gave her chills. She could see the joy of new friendships that had been made and the sadness that there was going to be a gap in time before they were together again. Every year I am in awe – if only the rest of us could be so unfiltered and so free as to express our joy and sorrow so unabashedly – another reason I love and appreciate our students so much! And with l’hitraot said, it was 9 a.m. and the bus was loaded with 50 students (magically the same number we arrived with – the chaperone team is that good!). There are so many of us we had to have an extra mini-bus – so the young team went with the kids and they kicked the four old-timers onto the smaller bus (truth be told we went gleefully!). 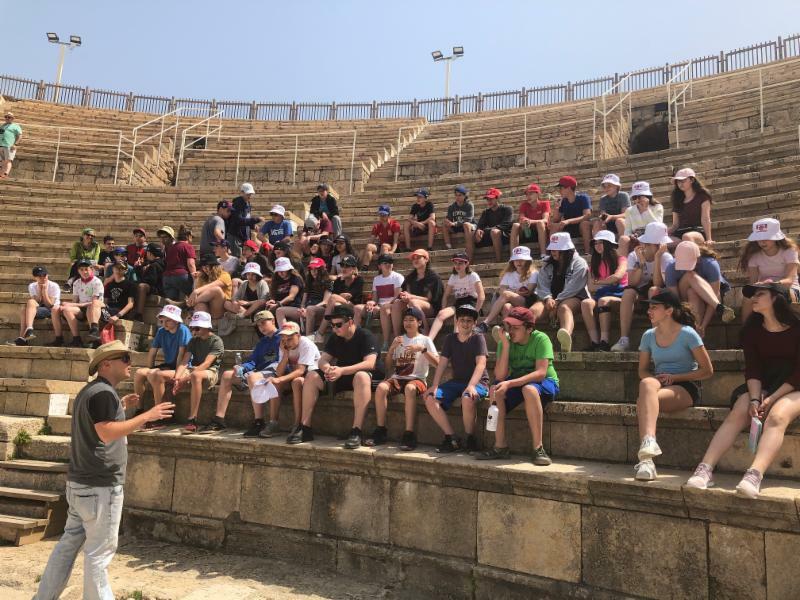 Next stop is Caesarea, home of some ancient Roman ruins including a wonderfully preserved theatre with very big steep steps – the Romans must have been in good shape. 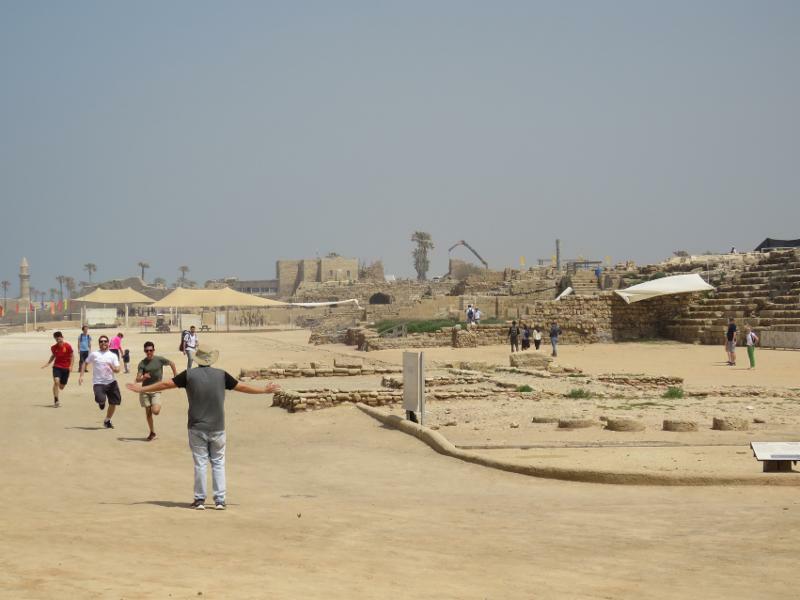 After a quick bathroom break (we do seem to do these often) we headed to learn, via a movie with English subtitles, the over 2000-year history of Caesarea. I have said before that the short version is that everyone ruled Caesaria for a while: Christians, Muslims, Jews. The video was a good brief summary. Then we walked and climbed the steps of the Theatre and headed over to the Hippodrome – which is where chariot races and fights took place. Mr. Dichter organized an epic battle (thanks Chase and Max K for being such good sports, and scary gladiators), and then we had a 2-legged chariot race – Mr Dichter against Joel and Isaac. The field was really slippery and although Mr. Dichter had the lead at the turn, slips by Isaac and Mr. D. gave the win to Joel (that and he was faster too, but you did not hear that from me). Then it was time for one last visit to the restrooms and gift shop for snacks – you just cannot have too many snacks! By 12:30 p.m. we were on the road to Arad – which is much further south towards our final destination of Kfar Hanokdim (KH). The drive to Arad was just over two hours – and we took an hour break there for food and for the ever popular Aroma. Now, those who have read my posts in the past know that Aroma is located in my heart in a heavenly place (iced coffee with ice cream – but as I am making better food choices these days -(yes, no Froot Loops either) it does not cause me the same delight – but it was still good to have an Americano (truth be told I think I have had almost two every day in the North at Aroma). By 3:45 p.m. we were on the road to KH where lies the large Bedouin Tent community. As we were actually ahead of schedule – this was a first – we made a side detour to a viewpoint in Arad that was stunning. We were looking out into the desert with the mountains (large hills) all around us encased in blue sky and solid haze that stretched into the far distant horizon. Here, our guide (did I forget to mention that at Caesarea we picked up our guide for the next few days, Barak – who also guided the trip last year) took us out onto this far cliff outlook point and told us his story and had us try to meditate under his guidance. It was a wonderful experience, eyes closed in this magical location with six solid minutes of absolute silence and breathing – I would say 90% of the students participated with sincerity – the sun was so warm and the wind was so strong in our ears (many a hat flew off but thankfully none were sacrificed to the valley floor below). Finally, around 5 p.m. we reached KH. First stop – camel rides. 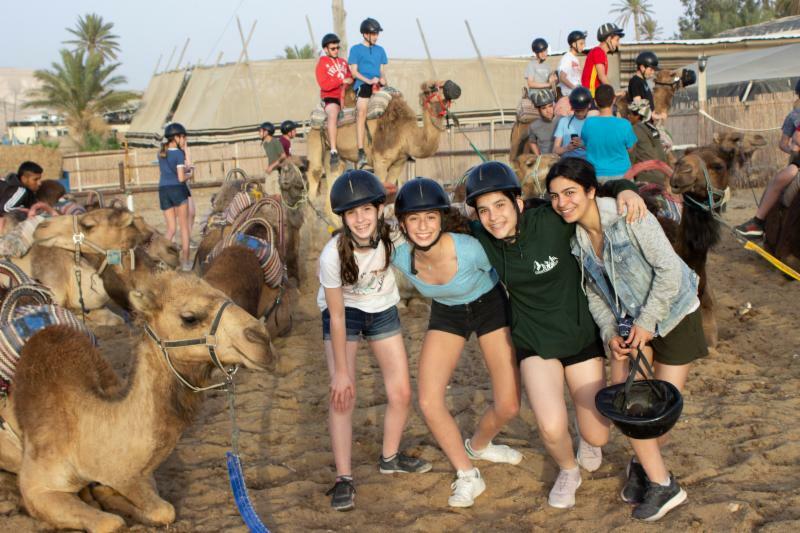 More shrieking – even after watching the safety video (yes, they now have a safety video on how to ride a camel safely – I guess they have lawyers in Israel too!). It was good fun! I was a late addition to the ride as I was not sure there were enough camels so I rode with Miss Lane (she denies it but I heard a shriek or too – it was her first time on a camel – so let’s keep it as our secret…). And for the record, it was all students who were doing the shrieking – when the camel gets up when you mount, and then later, down for dismount, it is quite disconcerting and shriek-worthy! As if all of this was not enough we then met for tea with a Bedouin Tent elder. 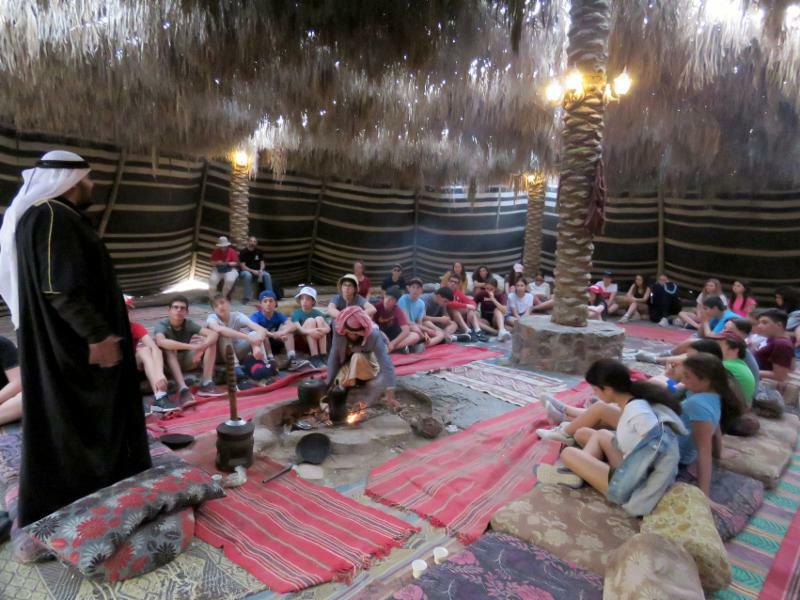 He explained Bedouin culture to us and how it has changed over the years. He reported that even his eight children have been "twitter-ed, shmitter-ed and instagram-ed" – it is not easy being a parent anywhere! 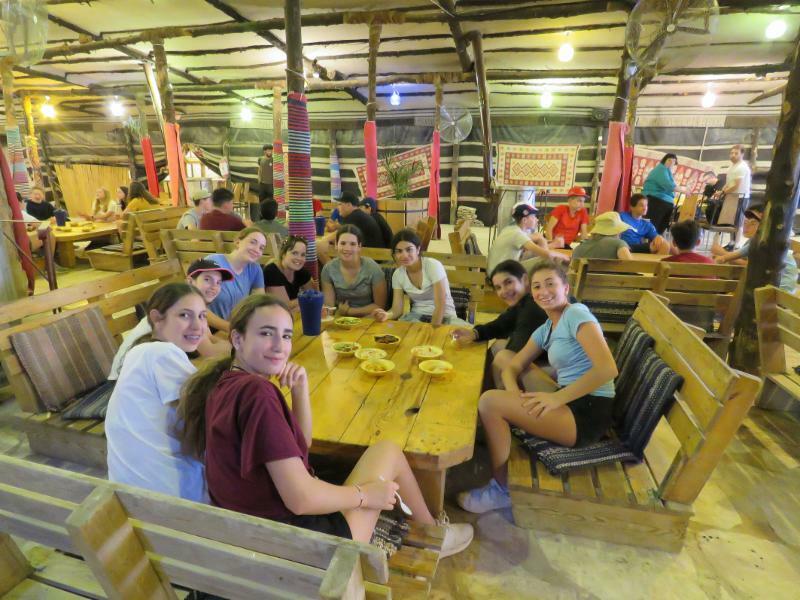 The kids seemed particularly interested in the fact that if a guest takes their shoes off the host must feed them and care for them anywhere from three hours to three days – now that is hospitality (and you had to serve your finest food – I am going to start wandering the desert!). After this half-hour visit where the students asked lots of questions (ie. a dowry is no longer paid in ‘camel’s but in ‘shekels’) it was time for dinner. We had a wonderful meat dinner – lamb kebabs, chicken legs, rice, and vegetable upon vegetable – with pita and lots to drink and oranges for desert (I know I did not mention hummus but this is Israel people – they eat it at breakfast!). Now, I am really getting tired – 12 hours after meeting at school we had a new activity for us – a drumming session (where do these kids get their energy?). The leader was phenomenal and everyone participated with full hearts and smiles. I sat a few feet away – not wishing to upstage any of the students by demonstrating my outstanding sense of rhythm. Again, compliments to the students for their energy and joy and participatory nature – they are really embracing the experience. One thing that disturbs me a bit about the kids is that when we told them we were waking them at 4:30 a.m. tomorrow so as to get going to Masada by 5:15 a.m. to greet the sunrise they did not complain or moan at all – I suggest booking appointments with their doctors as soon as they are home and ask them to perform the ‘teenager’ test (though I did experience eye-rolling the other day, so I do not know, maybe things are ok). As if things could not get any better, we then built a large fire and all sat around it on benches and the students talked about different aspects of this experience. 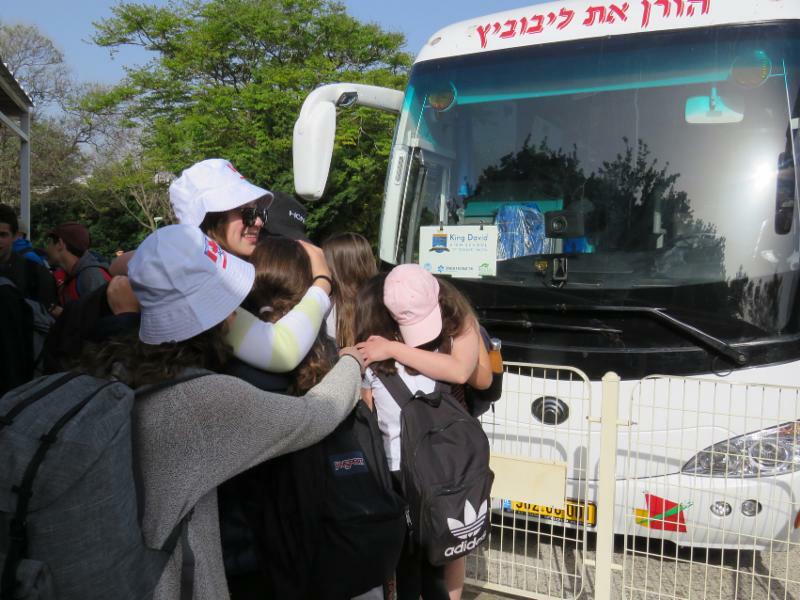 What really stood out to us was the gratitude the students had for being Jewish and being able to have this experience together in Grade 8 – they felt it was going to make a difference not only to their high school experience but to their lives. That is why we come but it was so rewarding to hear it. All the students are sleeping in this huge tent – 50 students and one security/medic guard, Dan, who has been traveling with us all day as well. It may have taken a little while to settle them down…or maybe not – what happens in Kfar Hanokdim, stays in Kfar Hanokdim! As long as today was, it is nothing compared to tomorrow – wish us luck!